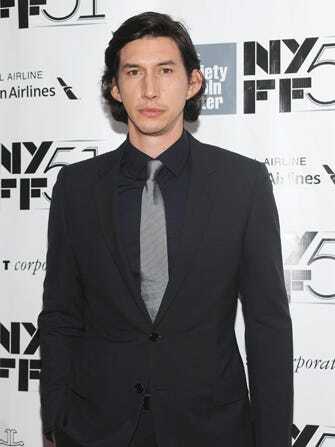 Girls' Adam Driver Cast In Star Wars Episode VII! According to a hot, hot exclusive report by Variety, your favorite weird, unwashed boyfriend and ours is in very late contract talks to join the upcoming Star Wars: Episode VII. The trade mag's "sources" say: "Exact details are unknown, but the character is said to be in the vein of iconic Star Wars villain Darth Vader." Indeed, we discussed the possibility of Driver being cast in J.J. Abram's sequel to the gigantic sci-fi franchise just hours ago. And, we said the 30-year-old actor was an unlikely choice. Apparently, we were dead wrong. Sorry, guys. It does make sense, however. Driver has a growing list of credits (that aren't all comedic) and, at 6-foot-3 with muscles to spare, he certainly has the physical presence to pick up where Darth Vader left off. Plus, as we've all seen on Girls, he does scary rage quite well. Finally, just look at him in this photo wearing a black suit and incredibly unimpressed glare. Are you feeling the power of the Dark Side? We are. To our earlier concerns, Variety says Driver has worked out his schedule so he can continue to appear on Girls.